Portraits are frequently shot at the client's home. Most people, especially children, feel more comfortable in familiar surroundings, and parents don't have the stress of preparing for an outing. Portraits can also be shot at an outdoor location. Parks provide beautiful backgrounds and are fun for kids. In addition to posed portraits, I try to capture candid shots - the fun playful moments between parent and child or siblings that will be cherished more and more as the years go by. A portrait session will usually last from 1 - 2 hours. The rate for an individual or family portrait session (up to 6 people) is $185. You will receive a CD of high resolution images, along with the license to have them printed at whichever photo lab you choose. Sessions usually last about an hour, and there is no limit on the number of images taken. On the CD I also provide a slideshow of all the images (one set in color and the same images also in black-and-white). My clients have found they really enjoy viewing their images this way. A website gallery can be also be set up at no extra charge for you to review your images and share them online with family and friends. Print orders are available through the website. I can also provide framing and album services. If you have a special idea in mind for an image, such as partial color on black-and-white, please ask. I give personal attention to each of the images, and producing the CD may take up to 2-3 weeks. Minor retouching may be done on some images; if major retouching services are desired, they are available for a fee. I recommend that people wear comfortable clothes, in solid colors or subtle patterns rather than loud prints. For family portraits, having family members in similar tones (all light, medium, or dark) and similar colors (shades of blue for example), help to place the attention on people's faces rather than their clothing. For outdoor portraits, I recommend against wearing white, which can be very bright and distracting in sunlight. When the goal is an outdoor portrait, we can reschedule the shoot should it rain. An overcast day actually provides good lighting for portraits. I try to avoid shooting outdoors during the hours when the sun is high in the sky, as that does not produce flattering lighting conditions. Scheduling is important, especially for young children. Pick a time when you will all be well-rested and ready to have a little fun with each other. With this session, the focus is on the many wonderful little details and gestures of your child. Babies and toddlers grow so fast - this is a nice way to remember the way your child looks today. The cost of this service starts at $285, which includes multiple prints, mounting, matte, and frame. "A Year in Your Life"
This service typically includes 4 visits throughout the course of a year in your child's life. 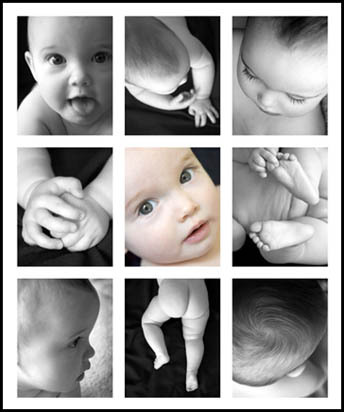 There are several possible display options, including arranging multiple photos in one frame or using several photos from each session in an album. Especially good for capturing all the amazing stages and changes throughout the first year. Birthday parties and other special events are covered in a photojournalistic manner. Charges for this service vary depending on length of time and number of images desired. 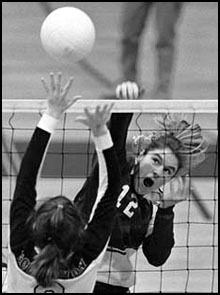 Action photography of your athlete at any sports event. Please contact me for pricing. Assignments are shot on location, and delivered as high resolution image files on CD, DVD, or ftp, or as 35mm transparencies. Rates for commercial and editorial assignments are based upon the type of use, the circulation of the publication and the extent of licensing rights granted. Contact Kristine Anderson via e-mail at kris@kmaphoto.com or phone at 425-941-7400.